With industry leading performance and reliability, the Trimble FmX integrated display is the display you need to handle just about everything. From guidance to steering, rate control to yield monitoring, the FmX integrated display has you covered. EDIT: Trimble has discontinued this display, as of October 2017. 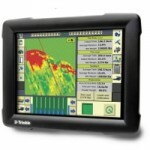 Trimble will still continue to honor existing warranty and repair options to the hardware for another 4-5 years. Keep watch on our Classifieds section for discounted units for sale!